Freeborn, Jeremy. "In Conversation with Tessa Virtue and Scott Moir". The Canadian Encyclopedia, 14 November 2014, Historica Canada. https://www.thecanadianencyclopedia.ca/en/article/conversations-with-tessa-virtue-and-scott-moir. Accessed 25 April 2019. ​On 6 June 2014, author Jeremy Freeborn interviewed three-time Olympic medallists Tessa Virtue and Scott Moir for The Canadian Encyclopedia. On 6 June 2014, author Jeremy Freeborn interviewed three-time Olympic medallists Tessa Virtue and Scott Moir for The Canadian Encyclopedia at the Canadian Olympic Committee’s Celebration of Excellence Parade in Calgary, which honoured the Canadian athletes who participated in the 2014 Olympic Winter Games in Sochi. JF: Tell me about the first time you skated together in 1997. SM: It was a long time ago. Tessa was seven years old and I was nine years old. To be honest, I don’t really remember much but I remember being too shy to talk to her. That was about it. JF: Was there initial chemistry between the two of you or did it take some time? TV: I’m quite certain we had zero potential at that time. I’m sure anyone watching us would have thought we were two kids having fun and that’s what it was. So, we were so lucky that we continued. Our parents sat us down every year and asked if we wanted to commit to another season and that’s how our partnership really evolved. JF: Were both of you always interested in ice dancing? SM: Not really. When we were young, we played every sport. That is what we did. I was most interested in hockey before I was a teenager and soccer in the summers. I think ice dancing kind of chose us. TV: My parents wanted to expose me to every different sport and I was so fortunate to have that opportunity. 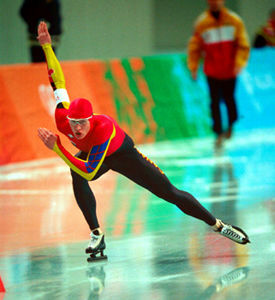 Skating was just one of the many activities on the list. I think because we started at such a young age and then eventually had some success, we just kept going and we learned to love it. JF: Tell me about winning the Olympic gold medal at the 2010 Olympic Winter Games in Vancouver and becoming the first Canadian figure skaters to win an Olympic gold medal on Canadian soil. SM: Yeah. That was a huge honour. For us we were just very thankful to be Canadian skaters and come from a great history of ice dance in Canada. We were just continuing the history of great Canadian ice dance. You know, Tracy Wilson and Rob McCall and Shae-Lynn Bourne and Victor Kraatz. Obviously to be able to do it in your own country was really extremely special. Memories we won’t forget. At the same time, we owe it to those who came before us. JF: Tell me about winning your first world championship gold medal at the 2010 World Championships in Turin, one month after winning Olympic gold. TV: That was just such a whirlwind season for us. Coming home from the Olympic Games we were absolutely exhausted. I think looking back at the podium pictures, there was more relief on our faces than enthusiasm. We certainly appreciated the opportunity to compete for gold and we were just so pleased to cap off our season that way. JF: At the 2014 Olympic Winter Games in Sochi, you struggled with your twizzles in the team competition, but bounced back with an excellent performance in the ice dance competition. Tell me about the twizzles and why perfecting that particular element is so important to the overall performance in ice dancing? TV: Well, the twizzles are a required element in ice dance. So, we get a grade of execution based on the judges’ score. We also get a level of difficulty technically. So, it is worth a lot of points. As you mentioned in the team event, it didn’t go exactly as planned, but we train those so hard at home and usually they are not a problem for us. So, it was nice to execute them well after that. SM: We really try to pack our short programs. We’re trying always to push ourselves to go as fast as we can and cover as much ice as possible. When you’re doing that, sometimes you catch an edge and it doesn’t go quite as well. It was really nice to pull everything together for the individual ice dance event. JF: What would you consider the most difficult element to execute in ice dancing? SM: I think ice dancing is also about what happens in between the elements. The elements are extremely important and you need to have cool lifts. But what I think sets ice dancing apart from the rest of figure skating are the intricacies in between — skating close together, having a connection, and having a good upper body. I think that’s what makes a good ice dancer. JF: What would you tell young Canadians who have an interest in ice dancing? TV: I think it’s important to explore all different kinds of sports. We always talk about a healthy balance and just getting active, and trying all things that you are passionate about. For those interested in ice dance, work hard, don’t take shortcuts and don’t limit yourself. It is important to push the boundaries and try new things. JF: Looking back at your figure skating career, what would each of you like to be remembered for the most? TV: We always answer this question by saying we would like to be remembered as nice people, and good people who worked hard and really enjoyed what they did. SM: We feel we did this sport for a reason and we loved being part of this Olympic team. We just hope we were good team members and always remembered for being supportive of our team. Tessa Virtue and Scott MoirThe website for Olympic gold medalists Tessa Virtue and Scott Moir. Check out their photos, bio, and more. Figure SkatingNews and videos about Canadian figure skaters and skating events in Canada and around the world. From the Canadian Olympic Committee.